I don't watch many movies; I mean, I do, but not in the theaters! The last Bollywood movie I saw at the theaters was 3 Idiots and I was totally shocked today when I realized that was in 2009!! 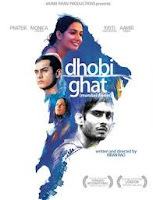 So today, after a long time I went and saw Dhobi Ghat - Mumbai Diaries. The funny thing is I went without a clue about the movie. I hadn't even heard of it till my friend asked me if I wanted to go, a week ago. We're not exactly die-hard Bollywood fans anymore, my family, I mean. But if someone had warned me about the artsy-ness of the movie, I wouldn't have paid to watch it! But I'm glad I did. It was not the typical Bollywood movie, which was great! Of course, it wasn't exactly 'brilliant', but it wasn't all that bad, either! I am not a big fan of movies with no particular plot as such, and I can't appreciate a movie just because the filming and effects are good; but the characters of this movie somehow made it interesting! There was sort of a mysterious air to the movie, never letting the audience know more than was absolutely necessary. There was just the right amount of drama - the right amount of romance - the right amount of humour and the right amount of boring! I have to admit though, those video tapes got a tad bit irritating after a while. For me, it was the little things that made the movie special. My personal highlights were the painting(duh! it was awesome), Munna's cat(aw) and every time he got really shy I just had to laugh! The characters were good and the actors as well. Not only did Prateik totally steal the show, but I also thought Aamir did a great job of letting Prateik steal the show! It could have easily been a movie revolving around the superstar, like most Bollywood movies are. I'm not going to claim I "understood" all of the messages that the movie offered, but it sure kept me involved the whole time(inspite of my friend periodically commenting that she was bored, and not to mention, the crazy comments!!). That's more than I can say about most Hindi movies. Like, I just read that apparently the old lady that just stares blankly at people, silently watching, is a symbol for Mumbai! Thinking back, that kind of makes sense! Gave us a whole load of laughs, though, that woman!! nice that you enjoyed it. art movies are not exactly boring. it needs a level of understanding that viewer has to invest. people are averse to it because of their reluctance to think. i personally feel there is no harm in giving some exercise to brain once in a while. Haha, well, I think it requires more patience than understanding, and I don't have that kind of patience, usually! This movie wasn't as modern-arty as an MF Hussain painting, and it wasn't that long, so that might have helped!! :D But, yes, I do recommend it to skeptics like me as well! the acting was really understated and at no point in the movie did I think, "this is SUCH a hindi movie! ", you know what I mean? like the old lady didn't get up and tell us her life story in a dramatic finale! thank god for that! For once, I actually got involved in the characters so it didn't matter that they didn't give a "conclusion" to the story. I don't know why people have had such a strong HATE reaction to the movie though! I'm not artsy at all, and I still liked it! All movies, even all the artsy movies have the happy ending. Where they explain everything, get teary and give long speeches! This was so realistic, I actually loved the ending!! I know my friends were 'mad' that in the end she chose no one; I think maybe, the movie was more mature than most audiences are used to! !